"Looks like half of Salem just got hacked." This is one wild & crazy trailer! Neon has released the full-length, official red band trailer for the film Assassination Nation, one of the big breakouts from the Midnight category at Sundance this year. From writer/director Sam Levinson, the film is about the town of Salem, Massachusetts and how everyone loses their minds when a hacker releases the entire internet history of everyone in the town. It's much smarter than you think and features some incredible filmmaking, not only with the performances but everything else about it. The cast of rowdy youngsters includes Odessa Young, Suki Waterhouse, Hari Nef, Abra, Anika Noni Rose, Colman Domingo, Maude Apatow, Kelvin Harrison Jr., with Bill Skarsgard, Joel McHale, and Bella Thorne. This is one super violent, bloody, intense trailer but they're pushing this out to give everyone a taste of what this film really is like. I've been raving about this film ever since its premiere at Sundance, and I expect it to be a big hit once it hits theaters. You can still watch the first teaser trailer for Assassination Nation here, or the original festival teaser here. In my Sundance review: "It's invigorating, impressive filmmaking that can ignite some spark deep down…"
This is a one-thousand-percent true story about how the quiet, all-American town of Salem, absolutely lost its mind. Description from the Sundance guide: "High school senior Lily and her crew of besties live in a haze of texts, posts, selfies, and chats—just like the rest of us. So when a provocateur starts posting details from the private digital lives of everyone in their small town of Salem, the result is a Category 5 shitstorm. We’re talking browser histories, direct messages, illegal downloads, secret text chains, and way, way, way worse. People get angry. Like, “rampaging murder posse” angry. And Lily finds herself right in the middle." Assassination Nation is both written and directed by American filmmaker Sam Levinson, director of the film Another Happy Day previously. This premiered at the Sundance Film Festival this year in the Midnight category. 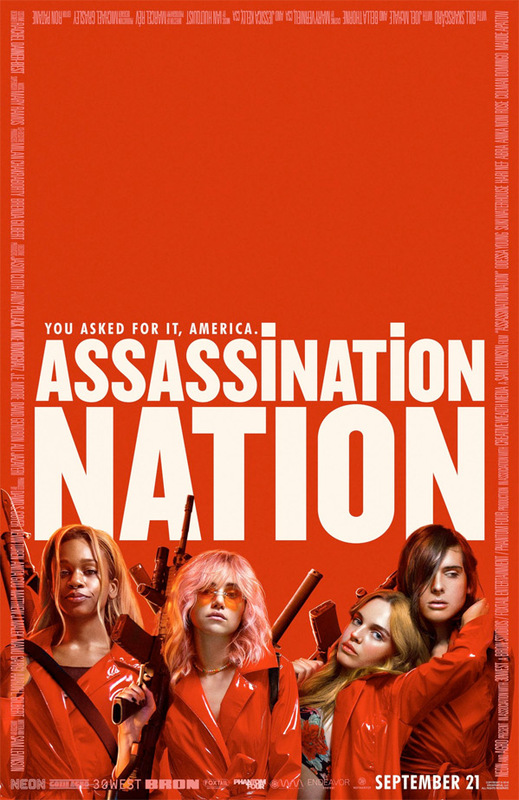 Neon will release Assassination Nation in select theaters starting on September 21st in the fall.